A study says that one out of every five citizens over the age of 65 had been victimized by a financial scam. The swindles are carried out by family members, caregivers and strangers, with theft by family members ranking as the most frequent. NEW YORK (TheStreet) -- Seventy-three-year-old Charles S. Bacino lay dying in a hospital bed in Las Vegas, on Nov. 27, 2012, when the man he referred to as his "financial affairs manager" stopped by for a visit to talk about his investments. Even as a morphine drip was working to soothe the pain of Bacino's terminal pancreatic cancer, his adviser persuaded him to invest $82,000 in notes of a cocoa and banana plantation in Ecuador. "My dad gave him keys to the house to get his checkbook," says his daughter Shari Snow, who sued the adviser in September. Snow, who is still trying to retrieve the money, says that less than a month after that hospital visit, her father was dead and the whereabouts of his money was a lingering mystery. Law enforcement officials and advocates for the elderly are increasingly alarmed at the rising incidence of financial abuse of senior citizens. The Investor Protection Trust, an investor information organization, said in 2012 that one out of every five citizens over the age of 65 had been victimized by a financial scam. People over 60 made up the largest age group reporting fraud to the Federal Trade Commission last year: 27% were 60 or older, up from 22% in 2011. While elder financial abuse is in some respects nothing new in the annals of fraud, the aging of the baby boom generation and Americans' increasing longevity are coming together in a perfect storm that could cause the problem to skyrocket. A 2010 survey by the Metropolitan Life Foundation estimated that victims of elder financial abuse lost at least $2.9 billion in 2010, up 12% from 2008. Experts say it will only get worse. "It used to be that they were more [targets of] petty thieves," says Debra Speyer, a Philadelphia lawyer who has specialized in elder law since 1990. "But now I'm finding a lot more people are being wiped out of everything." The swindles are carried out by family members, caregivers and strangers, with theft by family members ranking as the most frequent problem, according to the National Adult Protective Services Association. Presenting the ultimate quandary to seniors is that advocates offer various "must follow" advice that is often contradictory. On the one hand, advocates urge them to be sure that family members are kept in the loop about what financial advisers are doing, lest the adviser set them up for a con. 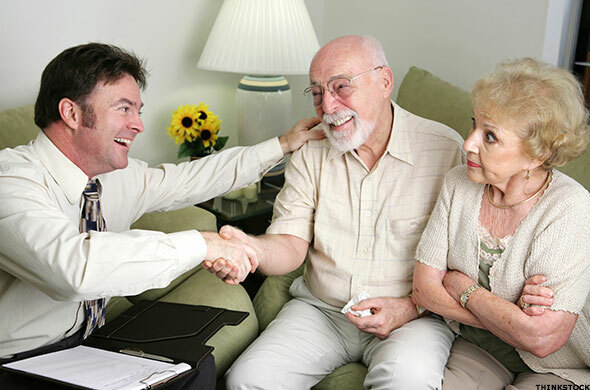 On the other hand, brokerage firms are telling their advisers to keep watch for signs that family members or caregivers may be on the take. "I think that's the tension," says Susan F. Axelrod, executive vice president, regulatory operations at the Financial Industry Regulatory Authority, which oversees the nation's 632,000 stockbrokers. "It's easy to say if you have someone exhibiting diminished capacity that you should get the family involved, but often the family members are taking care of their own best interests." Seniors who discover they're being fleeced by family or caretakers often don't report it, say experts, because they are ashamed that they've been victimized and fear reprisal from their abusers. Longevity is the gasoline being thrown on the fire, according to Speyer. "Twenty-five years ago, people just died earlier," she says. "In the 1990s, I was dealing with seniors who were much younger" and hadn't lost so much of their cognitive capacity. In addition, the increasing number of seniors who are comfortable with using the Internet is not helping things, Speyer says. "Once the scam is in Nigeria or Canada or Jamaica, you can't just get your money back, because it disappears like air." Speyer says one of her clients fell for a con man who said she'd won the lottery, but that it would take $400,000 upfront to access her prize. Today she lives in a state nursing home, having lost all her assets. Many seniors who have lost large amounts discover that Medicaid won't cover them: The government does a 5-year "look-back" at assets, which can mean rejection of benefits to the senior who was wealthy not long ago, but penniless today, Speyer says. Senior advocates say that among the assortment of scamsters from family members to solo con men, the best hope for victims is when it's a stockbroker who has taken advantage of an elderly investor. Brokers at least are registered with government regulators and work for firms that may have assets that can be tapped in a lawsuit. Seniors of means who have lost large amounts -- but not all -- of their money at the hands of brokers have the best chance of getting some money back in a Finra arbitration. Disputes over four- or five-figure amounts have little appeal to most securities lawyers: Investors of modest means aren't able to pay lawyers by the hour, and a contingency arrangement to take a third of any award wouldn't compensate a lawyer for his or her time. So you don't hear a lot about the smaller cases where fragile seniors have lost their nest egg, says Connecticut lawyer Joshua Kons. His client, 91-year-old Margery Hicks, is legally blind and hooked up to oxygen in her trailer home in Badger, South Dakota. A broker invested her entire liquid net worth of $55,000 in a risky, non-traded real estate investment trust after her husband died in 2007. That trust went into bankruptcy in 2011. Today, the former hairdresser relies on friends and family to provide food and basic necessities, says Kons. Her former broker says in his answer to her complaint that the retiree sought him out for advice and that he explained the risks to Hicks, who was then 84. He is still in the brokerage industry. Six other customers have complained about his advice since 2009, but only one has received any money back. Kons asked Finra for an expedited hearing, and an arbitrator is scheduled to consider both sides in May. "It was especially important for Ms. Hicks, given that she is in poor health and has no money left," that she get a hearing quickly, says Kons. Should her health fail further, making it impossible to travel, Kons already is considering a videoconference as a backup. Visuals matter when fragile, elderly victims have lost it all. Susan Antilla is a freelance financial writer and contributor to TheStreet.com. She is author of Tales From the Boom-Boom Room, the 2002 book that exposed a culture of sexual harassment at financial companies, and has written about business for 3 decades. She received the "Best in Business" award for her Bloomberg View columns from the Society of American Business Editors and Writers in 2013 and 2014. In 2013 and 2014, she also received first prize for personal opinion writing from The Connecticut Press Club. The New York State Society of CPAs gave her the Excellence in Journalism award in 2013, and the Society of the Silurians, a New York press club, gave her the Excellence in Journalism award for her columns in 2012 and 2013. She writes for The New York Times DealBook and Investopedia.com. Antilla is an adjunct professor teaching journalism at Fairfield University.